You can both redeem and earn PAYBACK Points on the same transaction. You can earn PAYBACK Points only on items that aren’t promoted or featured in DEALS. You cannot earn points on a transaction where you have applied a coupon or a promotion code. The PAYBACK Points hence earned will get credited into the your respective PAYBACK Account (linked with your eBay account) within 5 days. You will only be able to redeem the points after 45 days of the transaction. Until then, the points will reflect in your account in blocked state. 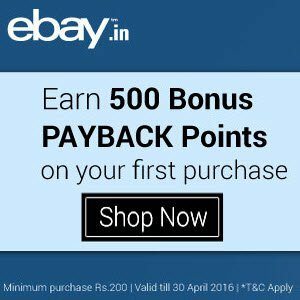 Ebay offer is valid till 30th April 2016. How to 500 Bonus PayBack points on Rs. 200 purchase at Ebay? Link your PAYBACK Account to your eBay account. PAYBACK – one of India’s largest rewarding loyalty program. Customers collect points from over 50 in-store and online partners – with just a single card. Millions of customers are part of the program and are taking advantage the benefits that come with PAYBACK. With the objective of providing our customers a truly rewarding shopping experience, we provide different ways of earning and redeeming PAYBACK Points. Customers earn points plus save more across leading partner websites like Amazon, Flipkart, Snapdeal, Jabong and more on shopping via PAYBACK Bingo. Earning of points also happens by booking domestic flight tickets at MakeMyTrip, publishing reviews on Tripadvisor, taking surveys on IMRB, Markelytics and a world more. Once the points are collected by our customers, we provide host of redemption options including buying tickets from BooMyShow, buying groceries from Big Bazaar. Additionally, there are over 1 lac reward options to choose from through the Infinity Rewards e-catalogue. PAYBACK also awards Bonus Points to its customers from time to time. Enroll here and bid goodbye to a pointless shopping experience because with PAYBACK, Nothing is Pointless! Customers can earn PAYBACK Points for all spends across the network and use them for further shopping.